The above photo (which I have colorized and cropped) from Wikimedia Commons illustrates how two similar wave patterns can interfere with each other. I have been working with this basic phenomenon as a possible way to create interesting patterns in LED displays that could be configured to interact with the environment. 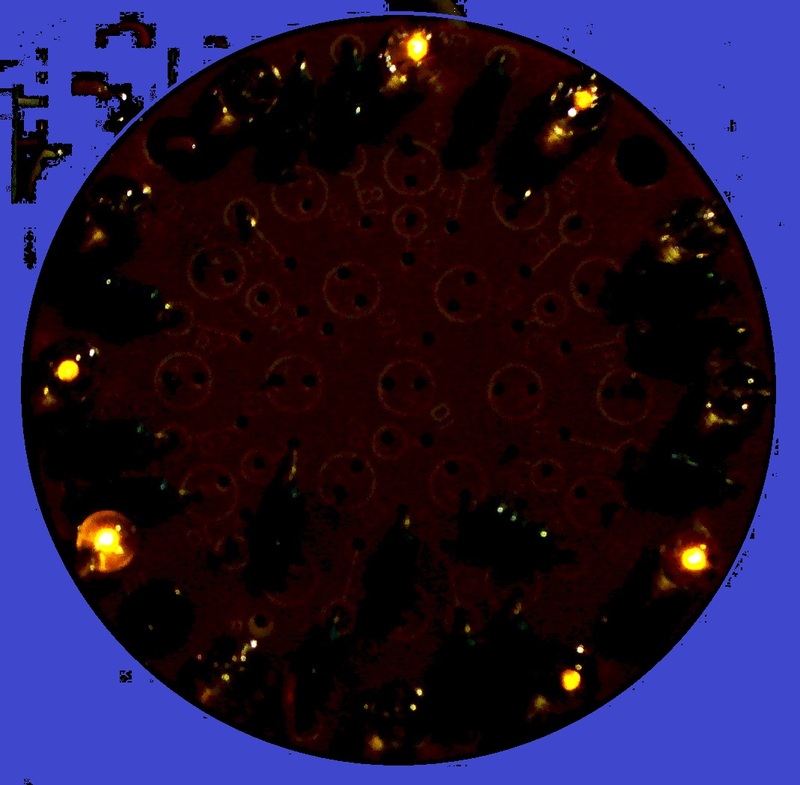 My simpler prototype uses 12 yellow LEDs in a circle. The illustrations below show them in rows. This made it much easier to draw the illustrations. The basic idea is to compare two different signals in a way that is interesting. This design uses voltage-controlled oscillators to create a pair of square waves. Each wave is then applied to a circuit that turns it into a repeating pattern with twelve parts. The corresponding outputs are then compared, and an LED is turned on or off depending on the result of that comparison. The comparison logic I used for my first prototype turns the LEDs on only when both outputs being compared are “on” (about +5 volts in this case). There are other types of logic possible. This particular one gives the lowest current usage from the power supply. So there are 12 LEDs, and each LED can only be on for one-twelfth of the time it takes for the pattern to repeat. But they will all fully light during their time slot only if the two signals being compared are exactly the same. Otherwise, the LEDs will turn on and off in a pattern based on how different the two signals are. Here I have illustrated a few possible patterns. 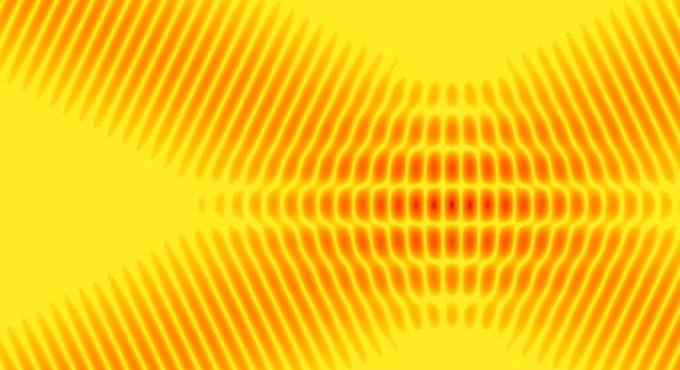 The yellow strip is the “reference” frequency, and the light blue strip is the other frequency. The lime green bands depict which LEDs will turn on, and for how long, based on my chosen comparison logic. If the two signals are close but not exactly the same, the circle of LEDs will dim and brighten as the signals slowly go in and out of alignment. This is similar to how two musical notes that are close to each other will “beat” (get louder and softer). If the two signals are a lot different, but related mathematically, they will produce a pattern of light and dark in the display. As it is almost impossible to adjust the two oscillators to exact frequency multiples, the actual result is a fast or slow rotation of the pattern, depending on how far off they are. Oddly, a 3 times difference in frequency produces a 2-node pattern. And a 4 times difference in frequency produces a 3-node pattern. Here is an image of my prototype – doctored to remove most of the distracting details of wiring and so forth on the circuit boards – showing a 3-node pattern that is slowly rotating. Here, three LEDs are much brighter, and three others are just beginning to turn on as the pattern slowly rotates. Three node pattern with LEDs in a circle. I also made a display that uses my “signature” pattern of 8 concentric circles, starting with one having only three LEDs in it, and ending with one that has ten LEDs. This is a more interesting display to watch, but the results are more difficult to interpret. It is also more difficult to make. So I will likely continue to work with simpler designs as I develop this idea. These designs don’t use any software; totally hard-wired, as they say. My experience with software that runs on controllers that I can afford is that it doesn’t run fast enough to provide a smooth display that doesn’t blink. So, though I plan to use controllers in some of these designs, I prefer designs where they are not needed and we are dealing totally with the real-time interactions of signals.